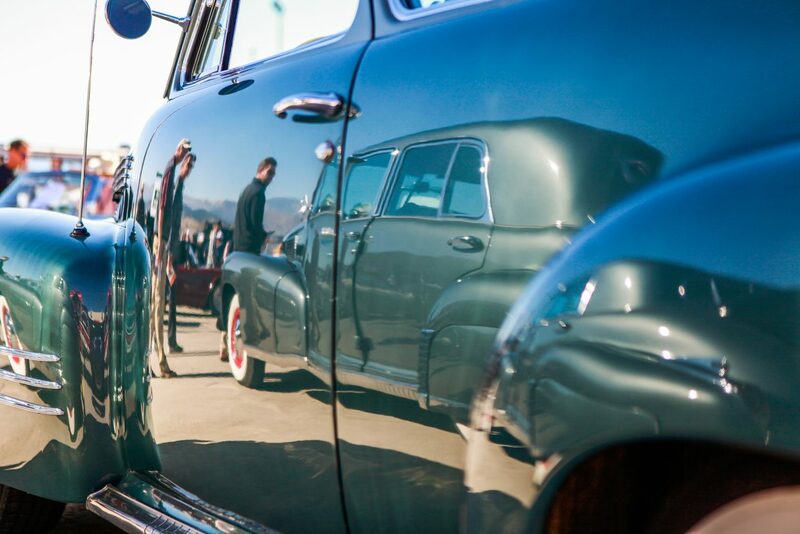 People look at the 1941 Cadillac 60 Special through the reflection of a 1941 Cadillac 62 Deluxe Coupe during Wheels and Wings Saturday at the airport in Gypsum. Hundreds of cars, planes, helicopters and other vehicles were on display as part of the event. GYPSUM — Local Tim Ludwig came to Wheels & Wings Festival looking to win the custom motorcycles division Saturday with a Harley Chopper he restored himself. He left with the award, as well as a new car. The seventh annual car and air show doubles as an auction, and when Ludwig realized he could leave with a ’78 Lincoln Town Car for less than $4,000, he put in the winning bid. He also got a chance to talk to its previous owner, Gypsum local Ken Hoeve, who purchased the car last year at the Wheels & Wings Festival show for $5,000. Best in Show in the cars division at the 2016 Wheels & Wings Festival went to Davis McCann for his 1932 Auburn. McCann, of Parker, said since finishing the restoration on the car this summer — an eight-year process — he has entered it into three car shows and won two, including Saturday’s. Best in Show in the motorcycles division went to Robb Talbot for his 1956 Taurus 200 ss, formerly owned by renowned photographer Guy Webster. The marquee brand featured at this years Wings and Wheels event was Corvette, and Warren Trapp of Ridgeway won Best Marquee with his 1954 Corvette. In a cosmic coincidence, Trapp’s $950 purchase took place in Bloomington, Illinois, which would become the home of the Bloomington Corral, now known as the Bloomington Gold, which started in the early ’70s and grew to become biggest Corvette event in the country by the ’80s. “It’s odd that this car is sourced from there,” McCann said. “I saw it in a little ad in the Chicago Tribune, they probably paid about 25 cents for the ad. They wanted $950, and my dad and I went down there and paid $950. Event director Ed Abramson said the Corvette was a perfect choice for the marquee car at this year’s event. For some, the thrill of the auction was tantamount to being behind the wheel of the cars it featured. Craig Held, of Eagle-Vail, found himself in a bit of a bidding war over a 1987 Porsche two-door coupe. “My wife said buy it, so I went for it,” he said. Going back and forth with another bidder, “it really got my adrenaline going,” he said. In the end, he won the car, with its original paint job and near-perfect interior. The auction took place in Hangar No. 3 at the Vail Valley Jet Center. Abramson said the cooperation with the jet center in allowing the use of the facilities was part of the reason the event has become so successful in the seven years it has now been running. Next year, however, things might get complicated. If you missed the show but want to see the cars, then many of the participants will be bringing their automobiles to the Vail Farmers’ Market & Art Show today starting at 10 a.m.